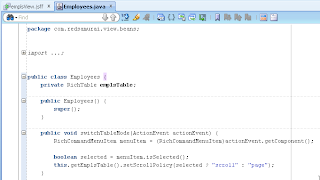 This is how we can control table layout. This is the new version 11.1.1.7.0 of JDeveloper and ADF, right? Could you explain me what the PSx mean? PS6 is just a short name for 11.1.1.7. I tested now, it works as expected. After sorting - pagination doesnt disappear. You should double check my sample app, it all works there. 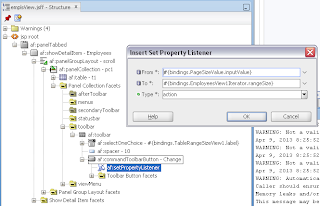 If I add a setPropertyListener inside the button it works fine. But when i try to change it in my backing bean, it doesn't get reflected on the screen. Nikhil, Just retrieve the iterator used for the table and call setRangeSize on the iterator as well setRangeSize on VO..this way it works. I have a requirement to move to next page programmatically. I have a rangeSize 10 defined which will fetch 10 records/page, but based on some business logic i need to move to next page(or nth page). Can you please suggest something . You can use out of the box table pagination available from PS6. 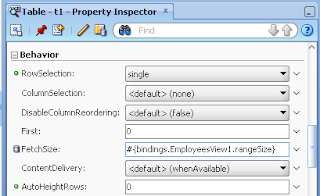 I am using new version 11.1.1.7.0 of JDeveloper and use the property scrollpolicy = 'page' and deployed the application on weblogic server 10.3.5.0 den Table pagination is working fine. search.jspx:352:29: This attribute is not recognized. May be there is no correct ADF runtime on this newer server? I am achieving the pagination functionality. Pagination nav bar is displaying below the table. I need to display the pagination nav bar above the table. Could you please suggest how to achieve the same? I need help to implement your example. I don't understand how to force table to execute query after clicking on the "Change" button. I execute your example and it works fine but when I'm trying to redo the same thing, I have to refresh my all web page to see Range Size modification. Andrejus, I found a solution for my refresh problem. 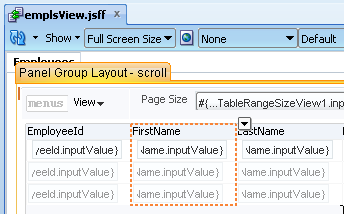 I'm using new Jdevelopper 12C and by default, it adds into web.xml deployment profile a context-param name "oracle.adf.view.rich.SYNCROWS" enabled by default. I removed thes line from web.xml file and now it's working as expected. i have this problem: my rangeSize=50 and the query return a greater number of rows(1700), my boss does not want a rangeSize that big becouse the app is getting slower, the problem reside when i want to select one row, gives me the null pointer exception only when the size of the query is bigger than the rangeSize, if the query returns 50 or less rows everithing works fine, what should i do if i can´t move the rangeSize from there? 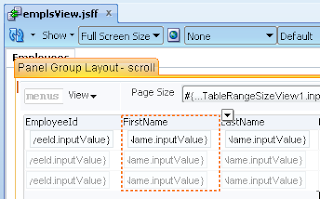 I have a requirement of ADF table pagination and select table row by using check box. But when i go to next page using pagination and then come back to the first page the selected checkbox value getting reset. 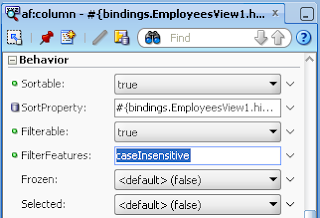 I have checked the update property of the attribute is also marked as always and in the VO tuning 'persist transient attributes' is also marked. Still the checkbox values getting reset. Please tell me why your example works on ADF 12.1.3.0.0 and does not work on 12.2.1.0.0 and 12.2.1.1.0? Oh, thank to Thomas Lassauniere! 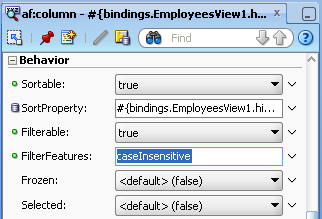 Setting oracle.adf.view.rich.SYNCROWS = disable, and everything works! I would not recommend using oracle.adf.view.rich.SYNCROWS = disable, this could lead to out of synch between ADF View fetch size and ADF model range size. 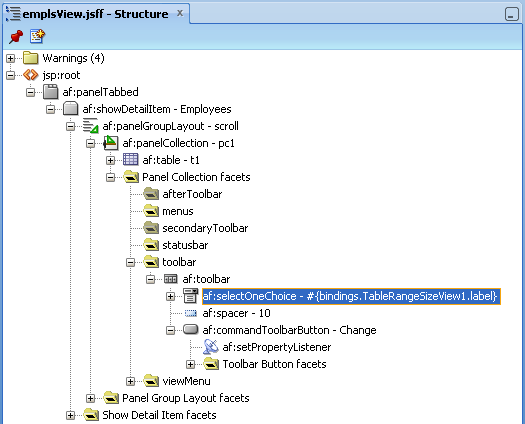 You could start seeing scenarios when data is saved for different row, not the one selected on UI. 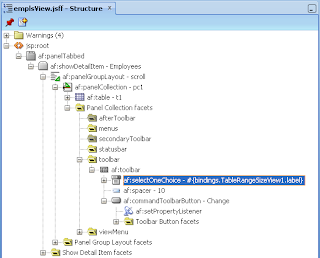 I am facing one issue related to table pagination. I have a checkbox in the table which is derivied from POJO data control. I have applied scroll policy as "page" for pagination purpose . 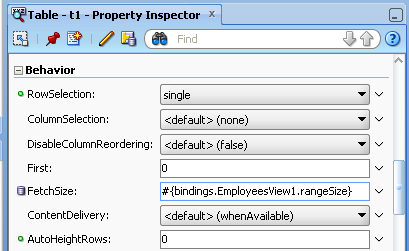 The checkbox value is not retained while traversing to and fro. Could you please provide an active link? 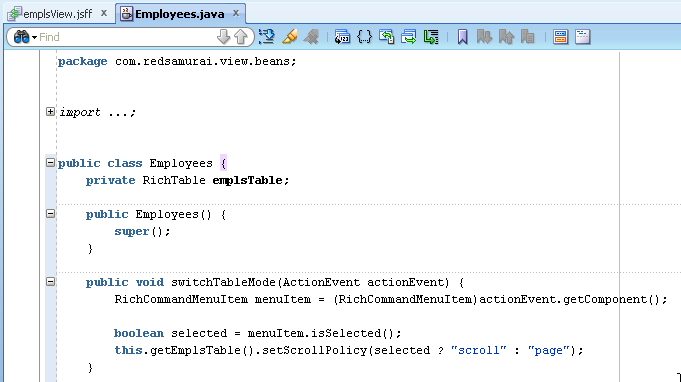 Am using Jdev 12c. 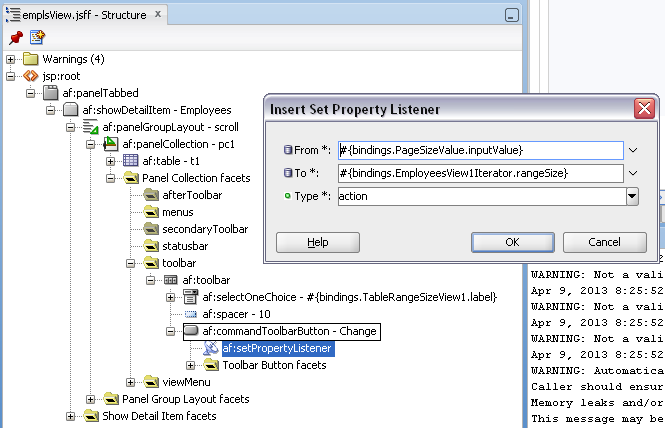 My current application has ADF table with pagination. The requirement is to show the pagination bar on top as well as bottom of the page. Any idea how can this be acheived in 12c? I tried for setting table_control-bar-position after reading few blogs, but this doesn't seem to be a valid attribute anymore. Also, with skinning, I can only have the navbar at one place, but my requ is to have at both places. Is this possible without custom bean code? I am trying to write a code which iterates all rows of range-paging VO, but even after changing the page by calling scrollToRangePage(), the getAllRowsInRange() is always returning same set of rows.